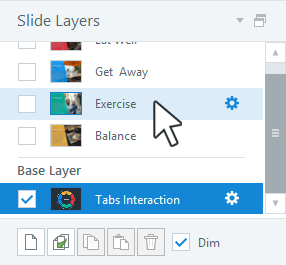 Articulate Storyline has a library of transitions to add polish to your slides and layers. When used strategically, transitions can even convey a sense of movement, pace, and direction. 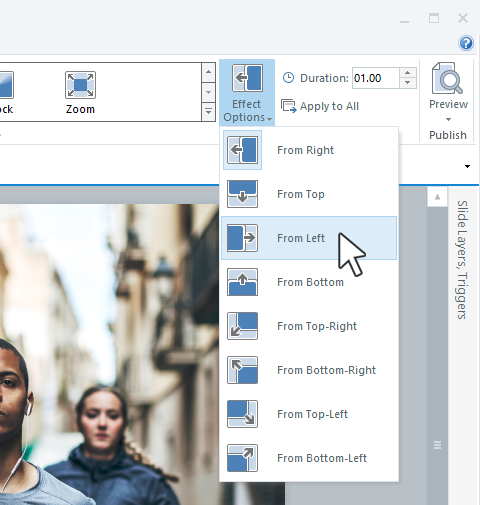 To apply a transition to a slide, open the slide in Slide View and select the base layer in the Slide Layers panel. To apply a transition to a layer within the slide, select the layer in the Slide Layers panel. Go to the Transitions tab on the Storyline ribbon and click any transition to apply it to the selected slide or layer. Most transitions let you choose the direction of the transition. Select your choice from the Effect Options drop-down. Adjust the speed of your transition by entering a time (number of seconds) in the Duration field, or use the arrows to increase or decrease the time. Can I Apply Transitions to Slide Masters?